The colectives Ativismo ABC, Biblioteca Terra Livre, Centro de Cultura Social and Nelca organizes the IX Anarchist Fair of São Paulo as a continuity of the traditional annual meeting of anarchists and friends from all over the world. For this edition, as in the other ones, there will be publishers fair and sale of books, newspapers, magazines, fanzines and other libertarian materials. 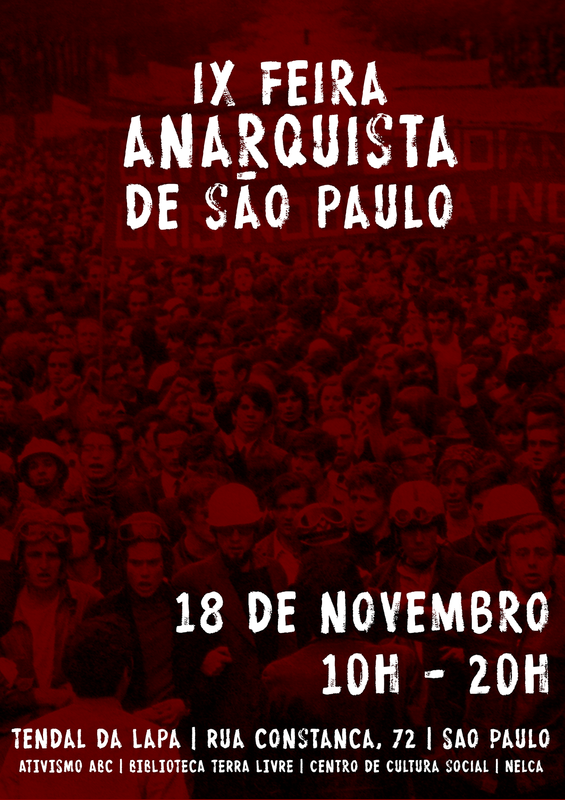 The Fair of São Paulo wants to gather Brazilian and foreign libertarian publishers. Together with the publishers fair, there will be many conferences and debates, as well as various cultural activities such as expositions, poetry reading, theatre and music presentations, and other. Place: Espaço Cultural Tendal da Lapa. 72, Rua Constança – Lapa, São Paulo, São Paulo, Brazil. Near the Lapa train station and bus terminal. Anarchist groups, collectives or publishers that are interested to participate and/or present your materials personally, please contact us by email: feiraanarquista@gmail.com. * Groups and collectives: you can send us pamphlets and/or banners with information on your activities to the exposition of world anarchist practices, or even send a video in which you can explain your projects and the group’s history. * Anarchist publishers: you can send us your materials, and we undertake its exposition and sale.